Those experiences that make me feel very afraid (or extremely disturbed). I had a rather horrific and surreal freeway experience on my way to my Chinese lesson a couple of weeks ago. A car ahead of me spun wildly out of control, probably going 65 – 70 miles per hour. It whipped back and forth across the freeway while halfway spinning this way and that. I was far enough behind to slow down and stay out of the way, but the out-of-control car didn’t come to a stop until it was about 20 yards in front of me, the next lane over and facing sideways! Then, it started to quickly pull out in front of me, the driver probably thinking she might be rammed from the side by on coming traffic. However, everyone behind me had slowed to a stop, too. Finally, she came to a complete stop and we all slowly passed. I imagine she went home and cried. One little speck of rat dung ruins the whole bowl of porridge. Just thinking about that makes me feel sick! If I think of that experience, at once I feel nauseated and break out into a cold sweat! This experience would make me feel scared to death. We went on to discuss how various sensations might have the same effect, but without being specific. We just referred to the sense involved. Eating this is very disgusting. That sound is very nauseating to listen to. It is disgusting to be touching this thing. What is this? It smells disgusting! If I think of those things, I feel nauseated right away. Thinking about this happening makes me feel sick! Thinking about this happening will make me feel so sick! If I had this same experience, I am thinking I will immediately feel very nauseated. In the odd twists that conversations sometimes take, I asked her if the 屎 of 老鼠屎 was a borrowed sound word from the English cuss word that sounds so similar. She said, no, it just means stool or feces in a rather ordinary way. However, there are other ordinary ways to refer to this common fact of life. In a family setting, particularly with young children, the language is much the same code words as used in American English. Since I raise chickens and have had goats, the word for manure was also mentioned. In the apparently cross-cultural attempt to swear without swearing, a person who wants to make someone else feel really bad might use this vocabulary. Hopefully this is something you will only hear in dramatic moments in a television show! Today was a rat dung kind of day, but today is over. Everyone will have good days and bad days. ❷ In my dictionary, both 惡心 and 噁心 are shown to mean nauseated, but my tutor says that 惡心(minus the radical 口 for mouth in the front of the “ě”) has a strong connotation of an evil heart instead. 惡心 for evil heart is pronounced slightly differently as ㄜˋ ㄒㄧㄣ (è xīn). ❹ Adding 起來 ㄑㄧˇ ㄌㄞˊ (qǐ lái) to a sensing verb indicates that the experience was passive, as in it was not sought out, but occurred to the person without initiative on his part. This is particularly appropriate vocabulary in these sentences because we do not seek out experiences that cause such fear or digust. 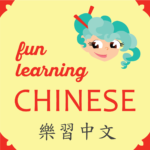 ❺ This is an example of using 好 ㄏㄠˇ (hǎo) to mean very. It does NOT in any way indicate this was a good experience. ❼ The implication here is that this trouble won’t carry on past today.